NESS ZIONA, ISRAEL / ACCESSWIRE / October 10, 2017 / Nano Dimension Ltd., a leader in the field of 3D printed electronics (NASDAQ, TASE: NNDM), announced today that its wholly-owned subsidiary, Nano Dimension Technologies Ltd., today celebrated the opening of its nano particle ink production facility. Scientists at this facility will produce advanced nanoparticle conductive and dielectric inks for its DragonFly 2020 Pro, the company's first commercial 3D printer for rapid prototyping of complex multilayer printed circuit boards (PCBs). The 8,600-square foot (800 square meters) facility is in Ness Ziona, conveniently situated in the same building as the company's headquarters and R&D laboratories. The production facility features advanced technological solutions, meets high-quality control standards and has a unique scaled-up manufacturing process to meet the needs of DragonFly 2020 Pro 3D printer customers in the coming years. 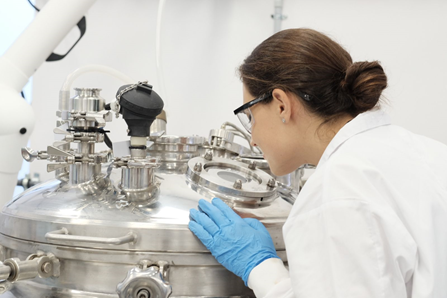 "We have made significant progress over the past several months to design and engineer an innovative continuous manufacturing process to enable us to increase production of our nano particle inks and compatible dielectric materials," said Amit Dror, CEO of Nano Dimension. "This extremely complicated process has been installed at our ink production facility, and it will allow us to efficiently scale-up and maintain our ability to supply customers with advanced materials, produced at our technologically sophisticated and cost-efficiently operated production facility, while keeping the trade secrets of the unique production processes." Nano Dimension's breakthrough inks, developed at its in-house laboratories, have unique compatible sintering and curing properties, as well as ink stability enabling precision, and engineered metal particle size. This unique combination of a dielectric material (for mechanical structure, high-temperature resistance and electrical insulation) and a conductive material for the circuitry with a very low melting point, solve some of the major challenges that, thus far, have prevented widespread use of 3D printed electronics. Nano Dimension's inks make it possible to quickly print three-dimensional, high performance, low-cost conductive patterns as well as complex structures on relatively heat sensitive substrates with Nano Dimension's DragonFly 2020 Pro 3D Printer. Nano Dimension (TASE: NNDM, NASDAQ: NNDM) is a leading additive manufacturing technology company. Nano Dimension is disrupting, reshaping, and defining the future of how electronics are made. With its unique 3D printing technologies, Nano Dimension is targeting the growing demand for electronic devices that require increasingly sophisticated features and rely on printed circuit boards (PCBs). Demand for circuitry, including PCBs - which are the heart of every electronic device - covers a diverse range of industries, including consumer electronics, medical devices, defense, aerospace, automotive, IoT and telecom. These sectors can all benefit greatly from Nano Dimension's 3D printed electronics solutions for rapid prototyping and short-run manufacturing. This press release contains forward-looking statements within the meaning of the "safe harbor" provisions of the Private Securities Litigation Reform Act of 1995 and other Federal securities laws. Words such as "expects," "anticipates," "intends," "plans," "believes," "seeks," "estimates" and similar expressions or variations of such words are intended to identify forward-looking statements. For example, Nano Dimension is using forward-looking statements in this press release when it discusses increasing production of its nano particle inks and compatible dielectric materials and meeting the needs of DragonFly 2020 Pro 3D printer customers in the coming years. Because such statements deal with future events and are based on Nano Dimension's current expectations, they are subject to various risks and uncertainties. Actual results, performance or achievements of Nano Dimension could differ materially from those described in or implied by the statements in this press release. The forward-looking statements contained or implied in this press release are subject to other risks and uncertainties, including those discussed under the heading "Risk Factors" in Nano Dimension's annual report on Form 20-F filed with the Securities and Exchange Commission ("SEC") on March 7, 2017, and in any subsequent filings with the SEC. Except as otherwise required by law, Nano Dimension undertakes no obligation to publicly release any revisions to these forward-looking statements to reflect events or circumstances after the date hereof or to reflect the occurrence of unanticipated events.